Researchers at the University of Leeds have developed a new theranostic tool that promises to aid in the fight against cancer. Composed of gold nanotubes that have been tailored to interact with infrared light, the treatment approach enables infrared imaging of tumors that have ingested the particles. If the strength of the infrared energy is increased, the nanoparticles will heat up, destroying the cancer cells. Additionally, the hollow nanoparticles could be filled with cancer therapeutics for targeted drug delivery. The term theranostics is a combination of the words “therapy” and “diagnostics”. Generally, theranostics are diagnostic tests that are used to support the application of specific therapies — for example, a point-of-care test for blood coagulation that is used to study the impact of a specific coagulation therapy being administered to a patient. Often, the two technologies will be developed in parallel in order to release them to the market together. In many instances, therapies and the theranostic tests that accompany them are based on completely separate technologies. The recent advance from the University of Leeds, however, achieves diagnostic and therapeutic functions using a single technology, according to a recent press release from the school. The new technology is based on gold nanotubes, which are thin hollow structures that resemble drinking straws, though on the nanoscale. Tightly controlling the length, inner void, and open ends of the nanotubes enabled the team to tune the nanotube interaction with near infrared (NIR) light, according to a recent study published by the team in Advanced Functional Materials. Interaction with NIR light is a property that the team exploited for imaging via a photoacoustic process. 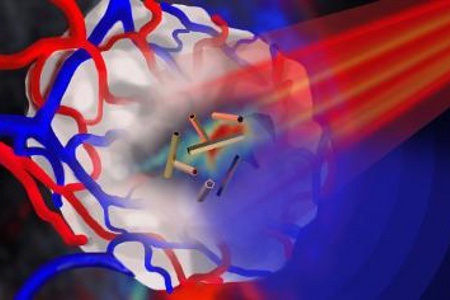 If desired, the energy levels of the NIR light could also be increased, causing a photothermal ablation of cancer cells to which the nanotubes were localized. Both the imaging and thermal ablation effects of the gold nanoparticles are dependent on their being preferentially ingested by their target cancer cells. This is achieved by coating them with poly(sodium 4-styrenesulfonate) (PSS), a material that increases cellular uptake by colorectal cancer cells, according to the study. In addition, the coating decreases the cytotoxicity of the particles a key requirement for them being tolerated during use. When intravenously injected into a mouse model, nanotubes not taken up by the tumor cells were rapidly excreted, according to the university press release. This is important for clinical use, because it ensures that the excess nanoparticles will not accumulate in an undesirable location, potentially causing side effects. This application of gold nanotubes is the first time such a technology has been successfully tested in vivo, according to the study. While this may be the case, other teams are actively studying methods of fabricating gold nanotubes for similar applications. For example, a research team at Technische Universität Darmstadt recently disclosed a method of fabricating gold nanotubes that used only green processes and chemicals, according to a recent story on Med Device Online.